Just weeks after Google unveiled a new way to stream apps from search results without downloading them, it’s now turned that into a new mobile advertising format. Today, the company announced “Trial Run Ad,” which will let users sample an app for 60 seconds before receiving the download prompt. A timer at the top lets you know how much time you’ve got to, um, jam those cookies? Trial Run Ads will likely be popular with gaming apps, allowing users to stream a game before deciding if they like it enough to download the whole thing. It’s a strategy that Google sees as win-win for both consumers and developers. “Users get a taste of the game before going through the download process, and the app developer attracts better qualified users who’ve chosen the game based on their experiences in the app,” Google writes in a blog post. 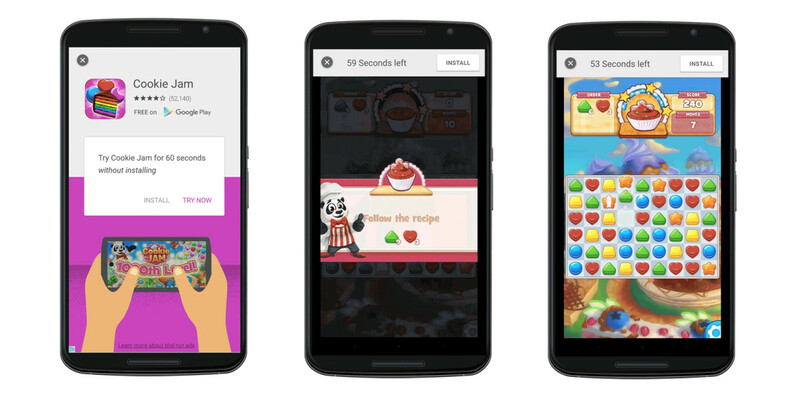 In addition to Trial Run Ad, Google will also utilize HTML5 to let advertisers create interactive interstitials, such as swipeable galleries (a la Instagram and Facebook) or scratch-off ads. In a sample ad by shopping site Zalora, its ad lets users experience and gauge the value of its service to hopefully receive installers that’ll producer higher user engagement in the long run. Both the two new ad formats are available today in beta to a select set of advertisers.